Crocodiles and Alligators have been roaming the Earth since the days of the dinosaur. They are Nature's ultimate survivalists and given their propensity for the craft, they're perfectly capable of adapting to any difficult circumstance thrown at them. The word 'crocodile' comes from the Greek words 'kroko deilos', which translates to 'pebble men'. It is a reference to their scaly skin, which provides protection against the harsh elements and any predator strong (or crazy) enough to trifle with these powerful creatures. But despite their almost impenetrable armor, Crocs and Gators have a vulnerability about them as evidenced by their soft underbellies. In the ancient world, Crocodiles were revered as powerful deities of Creation and Life. The Egyptian god, Sobek, was frequently worshipped in an effort to protect pilgrims living along the sacred Nile against the ferocious crocodiles in the river. Sobek was a creator god and was often depicted with the symbol of life, the Ankh. The Egyptians were so enamored by these intriguing creatures, that they built a prosperous city of Asinoe (later renamed Crocodilopolis by the Greeks)in its honor. As an extension to their role as creators, the Mayans believed that the world is supported by four massive crocodiles. Native Americans held these incredible reptiles as symbols of Power and Status. In the Hindu tradition, these untamable animals command the Svadhisthana, the spiritual energy responsible for Creation and human emotion. Since the Crocodile is closely associated with Water, the natural element of the subconscious, emotions, and sexual energy, it's no surprise that crocs are seen as the animal totems for the Svadhisthana. Even the English language is influenced by these powerful animals. Shedding 'crocodile tears' is a tip of the hat to the connection between the human psyche and these amazing creatures. The legendary mating call of the Crocodile has come to symbolize Masculine Power and Virility. Male crocodiles are famous for bellowing to the apples of their eye by vibrating their bodies in such a manner that it causes the surrounding water to 'dance'. This mating call can be heard for miles around and is a fascinating sight for any nature lover to taking in. This may account for their reputation as suave Casanovas and the prominence of Crocs and Gators in many Creation legends worldwide. After all, no beautiful swamp belle can resist the enchanting calls of a dashing crocodile debonair! In general, these two animals have very few dissimilar traits making it easy to confuse the two and accounts for why they often represent the same symbols. The difference between the two rests in their physiology. The most obvious deviation lies in their snouts. Alligators have shorter, rounder snouts with heavier heads, while Crocs have longer and sleeker snouts and heads. Crocodiles on a whole are usually larger and more aggressive than their Alligator cousins and have a habit of living in saltwater areas. On the other hand, Alligators love swamps and fresh water regions. The mouth is wider and looks like the U letter. Some of the teeth are hidden. Alligator can't live in salt water areas. That's because they have glands for emptying salt only in their jaw. The mouth is longer and thinner. Looks like the V letter. Expose teeth that locks and look like a zipper. Can Stay long period of time in salt water because they have glands for emptying salt all over their body. Much more dangerous predator compare to the "submissive" Alligator. Your tattoo design can incorporate any number elements. From tribal patterns to comical cartoon characters, Alligator and Crocodile Tattoos come in a variety of colors and sizes. Alligators and Crocodiles are one of nature's most primal animals, as such, it's no surprise that Tribal Alligator and Crocodile Tattoos are the most popular of the genre. Tribal patterns come from a variety of regions worldwide and convey significant spiritual messages within the culture of the indigenous peoples to which the patterns belong. Tribal Alligator and Crocodile Tattoos represent not only a strong connection to the natural element, Water, but also the raw power of an incredible animal, Masculine Strength, and Virility. Sometimes Reptile Tattoos include pop culture elements like cartoon characters. It's an interesting contrast when a fierce and fearsome creature like the Alligator is portrayed as a lovable, harmless little tyke. 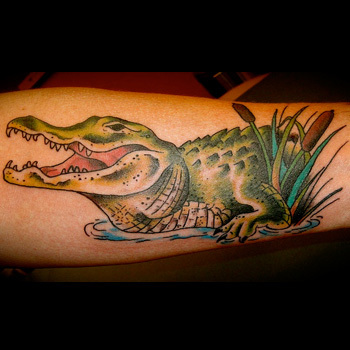 Cartoon Alligator and Crocodile Tattoos express your lighter, more innocent side. In essence, you are a gentle soul, but underneath the surface lies a force to be reckoned with. The right Alligator and Crocodile Tattoo can make the difference between a piece that you like and artwork that you'll absolutely love. When choosing your new body art, think about what your new tattoo will symbolize, where you'll put it on your body, and whether or not the design complements your personality. If you need help creating the perfect piece, then visit our design page at www.itattoodesigns.com and take advantage of our Custom Design Service. Our team would be more than happy to help you can design truly unique artwork.